At Intimidator, Safety Is A Priority! | Intimidator Inc.
At Intimidator, we love to ride UTVs. Some of us love a rocky hillside to crawl. Others love to take it easy and putt around our farms. And a lot of us, we love to go fast. Well, most of us. We may differ on how we like to use our Intimidator Classics, Crews and Trucks, but we do all agree on one thing. At Intimidator, safety is a priority. We understand that with each UTV we build, we are putting the safety of our customers in our very own hands. It's a responsibility we do not take lightly. We all put our kids and grand kids in our UTVs. They are watching us, learning from us, and mimicking what they learn. Safe hauling, loading and driving practices are imperative. Our machines are built to the highest safety standard we can possibly build, and our sales and dealer teams are tasked with getting the message out about hauling, driving and loading those machines safely as well. That's why, in 2015, we began testing all our vehicles to meet ROHVA standards. The Recreational Off-Highway Vehicle Association, ROHVA, was formed to promote the safe and responsible use of recreational off-highway vehicles manufactured or distributed in North America. ROHVA is accredited by the American National Standards Institute (ANSI) to develop a standard for the equipment, configuration and performance requirements of ROVs (Roll Over Vehicles). ROVHA offers free courses for new drivers, including a Basic Driver Course and an E-course that reinforces key risk factors associated with ROV operation, safe driving practices that will reduce risk of injury, and the best resources for learning about your particular vehicle. There is also an Open Trail Course that is for more experienced drivers, helping them gain experience driving on rocky and sandy terrain, fording water, and clearing obstacles such as hills, mud, and rocks. These courses are all free and available to the general public. 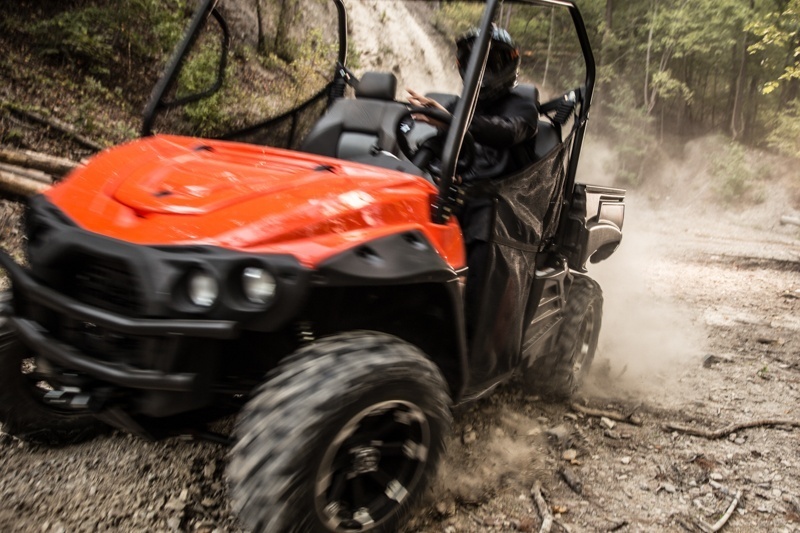 Here are some tips from ROVHA that we pass on to our friends, family and customers, and strongly recommend they go over with their local dealer before purchasing and using their UTV. We also offer a safety video to all customers when they purchase a UTV from Intimidator. _____This Utility Vehicle must not be operated by anyone under the age indicated in the Operator’s manual. I will not allow anyone under the age indicated in the Operator’s manual to operate this vehicle. Every operator must read and understand the Operator’s manual before riding this Utility Vehicle. _____ This Utility Vehicle must not be operated by anyone who does not have a valid driver’s license. _____ Never ride a Utility Vehicle after consuming alcohol or drugs. _____ Overly aggressive use on inclines may cause the Utility Vehicle to flip over. _____ Always ride within your abilities. _____ Never attempt jumps or other stunts. _____ Always be extra careful when riding on unfamiliar terrain, steep slopes, or when encountering obstacles. _____ I have read the above warnings, and I understand that SEVERE INJURY OR DEATH can result from ignoring these warnings or from improper use.